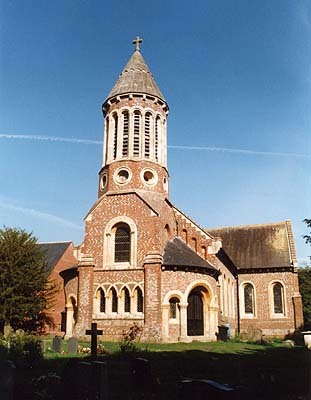 Burghfield Church was completely rebuilt in extraordinary Romanesque style in Victorian times. A picture of the old church is shown in one of the stained glass windows within. It looks rather delightful, with its two-tiered wooden tower. The interior is wide and open, but surprisingly dark. The chancel, however, is beautifully painted and gilded in the best traditions of Pugin. The plain 12th century font, given a little decoration two hundred years later, has been retained from the old church; and there are a number of interesting monuments. There is a fine Tudor brass to Nicholas Williams (1568) and his family. His uncle, Lord Williams of Thame, came from Burghfield. A 14th century wooden effigy of Sir Roger de Burghfield was stolen but, fortunately, managed to find its way home again after a 'ransom' was paid! Most fascinating is the medieval alabaster effigy of Richard Neville on the floor of the porch. He was the Earl of Salisbury and father of the all-powerful Warwick the Kingmaker. Executed after the Battle of Wakefield (1460) during the War of the Roses, he was buried at Bisham Abbey in East Berkshire. How the monument made its way to Burghfield after the Dissolution of the Monasteries is not known. However, legend says it was dragged 'from Newbury' behind two wild horses! The lady alongside him is not of the right date to be his wife, but she is, no doubt, one of the other Countesses of Salisbury buried at Bisham. Sadly, these nationally important monuments are now largely neglected.